Sassy Cheryl's challenge this week sure was a fun one. It is Spots and Dots!!! For my DT creation I used one of my most beloved characters.....CHARLIE! This image is The Wicked Witch of the West....so much fun to color!!!! The paper comes from several different pads...My Mind's Eye and The Paper Studio. All the spots and dots are a mixture of gem stones and enamel dots. Like I mentioned before...I am loving the new enamel dots. They add a final touch to my cards! The sentiment reads: Boo to You! I used Copic markers to color in Charlie and some orange dots to outline her and the cat. Click here to check out what those Sassy Gals have created for the Spots and Dots challenge. My goodness....they never cease to amaze me! How do I love this? Let me count the ways! So stinking cute!!! Love all your dots!! You've mastered that background for sure! 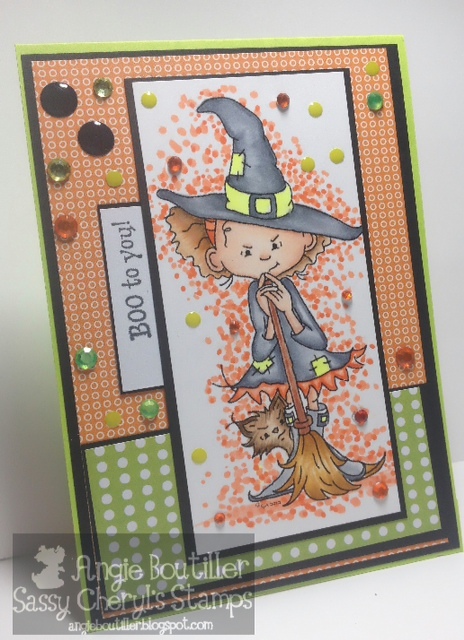 Gorgeous creation Angie! Love cute image. I do think I need to get some enamel dots. I have none and am in love with them after seeing your card. Super coloring!